Alexa.com is subsidiary of Amazon.com. It is a ranking system based on the level of traffic a website receives from people with the Alexa toolbar installed. Site which are having good traffic and with regularly updated content, will always have good Alexa rank. Though, it also depends upon many factors like niche, and some other factors, which I’m going to talk about here in this post. These tips, which I mentioned below are something which worked for me to increase Alexa traffic rank of my site and might work for you too. By the end, I would love to get one tip which worked for you. Alexa.com was founded in 1996 and initially it was just limited to data gathered by alexa toolbar, but with time Alexa traffic estimation have improved and they have added many features like you can claim your site on Alexa and update more details and info about your site. Though, many people say Alexa rank is not accurate and I may or may not deny it, but with latest updates in Alexa, I find it quite correct and seeing the traffic rank stats going up and down daily, I find it quite authentic to see how traffic of a site is improving. Apart from traffic stats, site linking in stats is updated once in 3 months. More over, those who are into SEO, they might be knowing Alexa is holy grail to find long tail keywords. But, let me now get off-topic here and lets stick to the topic. For new domains, it’s quite normal to see no Alexa data details and rank. It takes time, before you start seeing Alexa graph for newly created website. So, let me talk about some of the factors, which any blogger can apply and get better Alexa ratings. If your site have good Alexa website rank, you can always showcase as trust factor and ever advertiser are more likely to trust sites with good Alexa rank. First and foremost thing to increase Alexa rank is to write quality content. It will help you to improve website traffic and another thing is Google loves quality Content. Good content always strikes high-ranking in SERP’s and will help you to increase the amount of traffic on your site. Write guest post: It’s also a great way to increase Alexa rank. Guest post will help you to build back links, having good number of back links will improve Alexa rank and sites linking in number will go high. While writing guest post don’t forget the point no.1 quality content. You can also consider commenting or other methods of build backlinks, which will help you to increase sites linking in stats and gradually it will have positive impact on overall site traffic and Alexa ratings. I think it is the backbone of this system to increase Alexa rank. Write regularly for your blog and that will definitely help you to increase your Alexa rank. No one loves dead blogs where blog is updated once in a while, everybody wants good content on regular basis. You must write 1-3 post daily if you are a beginner in blogging career. 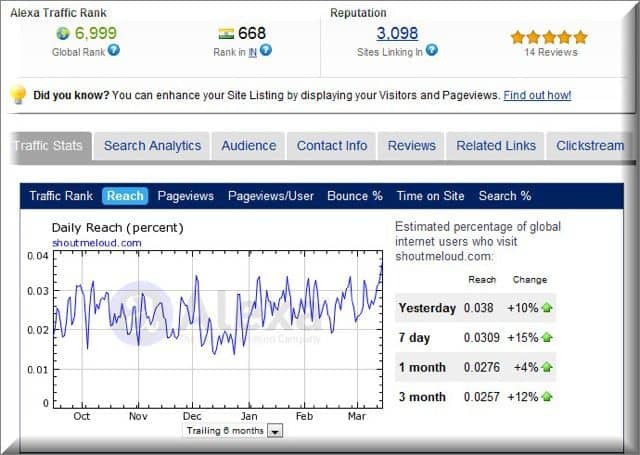 You will see the result that how fast your alexa ranking is increasing. Having a Alexa widget on your blog/website will help you to increase alexa ranking. It will show the current Alexa ranking status of your blog/website . All you have to do is register your blog/website to alexa.com and paste the code in the source code of your blog. Some time back, Alexa added review feature for sites, where you and your readers can give their feedback and rate a site. I’m not sure how it impacts over all Alexa traffic rank, but still good number of positive reviews add into trust factor of your site. You can see an example by clicking review tab on SML alexa stats. You can encourage your readers to write a review for your site or best way is to send out an Email newsletter to your loyal subscriber and let them know about a place, where they can add testimonial or review of your site. Anyways, these are some of the tips which will help you to increase Alexa rank and I would love to know if you believe in Alexa traffic rank and any other method you would like to share for boosting alexa.com stats for your site? Related articles Is There Any Trick To How To Improve Alexa Ranking?